His blue-bladed spear steaming and dripping, the Lord of Guards tore kicked the door to his wife’s chamber open, startling the cluster of women within. They looked up, terrified of what his words meant. The enemy was coming to devour their bodies and drink their souls. They stood frozen in their actions, still bloody from the birth. The newborn mewled in his wife’s embrace. Zerah was pale, sweaty and clearly exhausted and in pain. He had not wanted her here, pregnant and vulnerable, but she was an Heir. She belonged at the battlefront where her kin fought. The Great Families still had their honor. Besides, she provided an advantageous route of retreat. She was an Folder. “The lady can’t be moved,” the midwife said but Keleb brushed her aside. Keleb let go of the spear to take his unnamed daughter in one arm and two year old Ayla in the other. The instant the weapon left his hand it vanished in a bolt of light that shot up through the ceiling without a trace. Both his daughters in his arms, the Lord of Guards stepped away from his wife. She winced as she adjusted herself on the bed and summoned her black folder staff. Zerah closed her eyes, focused on the formulas, the mathematics and physics required to open a safe passage from the manor house to the Great House of Beyz some sixty miles away. Outside the room, the last of his guardians screamed as their lives were torn from them. Zerah’s eyes snapped open, her calculations complete. Lightning blazed from the black rod in her hand and tunneled through space pulling two points across the world together. The baby in Keleb’s arms began to scream. He turned to the women. Keleb hated portal travel. It was impossibly fast, but the sensation was unsettling. Fortunately, it passed in an instant. But instead of relief and a return to normalcy, Keleb emerged from the portal’s far end into a world of pain and noise. A searing gold light tore into his eyes, slashing into his retinas even through his eyelids. A weight seemed to slam down upon him, dragging him to his knees. He barely managed to keep his grip on his daughters. The baby screamed. A gale tore at them. He forced his watering eyes open as a shadow fell across him. He looked up into a silhouette framed against a scorching wall of light. 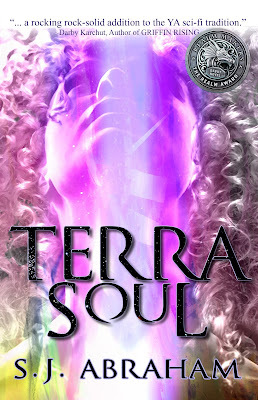 This is a deleted scene from my award winning novel Terra Soul. Check out this and many other extras in the hard cover, special edition.